I've been real busy lately, so posts have been lacking and book reviews are backlogged a bit as well. I did, however, want to post about SVK, a really cool comic book release I got my hands on recently. 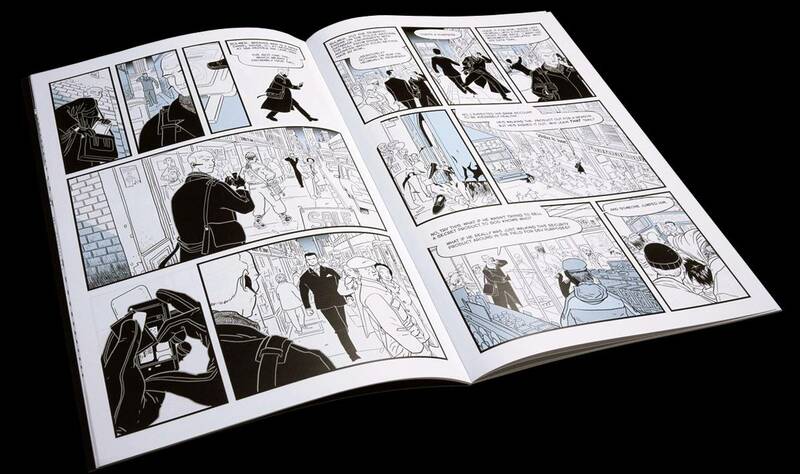 SVK is an attractively and minimalistically-styled, dark sci-fi comic by Warren Ellis & D'Israeli, about unchecked government control, with an augmented reality theme. The story centers on a gun-for-hire, hired to clean up a problem for a government security agency. While doing so, he uncovers the roots of what the real problem is and what they are trying to hide. The story is good but by no means unique. 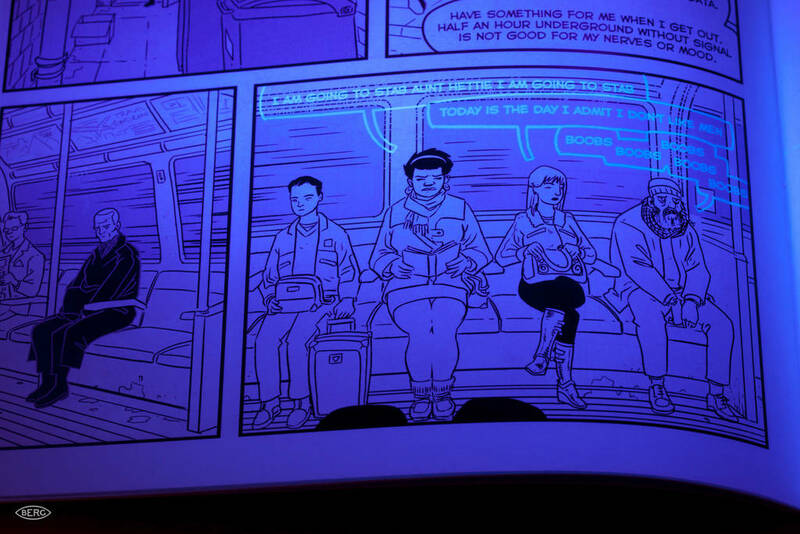 The thing that really sets SVK apart, however, is that it comes with a credit-card sized UV-flashlight, which you shine on the comic to reveal the augmented reality world that the protagonist is seeing. See the pics below. To add icing to an already delicious cake, the directives at the start of the book, the fictional ads directed at the reader, and the fact that the UV light is make to look like a secret SVK device, all conspire to poke at the 4th wall a bit, making the reader a secret agent of the future, if only for a for an hour. Many people are familiar with Edward R Murrow, mainly in the context of his role in challenging McCarthyism, as portrayed in the film Good Night and Goodluck. Even prior to this film, many are familiar with his role in shaping journalism and in particular with his barn-burner speech that I referenced here. I, for one, wasn't familiar with his life up to that point, and so when I came across the audiobook version of Edward R. Murrow and the Birth of Broadcast Journalism, I decided to pick it up. Highly recommended, especially in audiobook form. First off, the book is a good study of how Murrow's principles guided his actions. He was able to steer a course in complex scenarios because he had a clear view of what he believed was right. Still, there were times where he decided to pick his battles, but this was more about astute politics than it was any wavering in his principles. Secondly, it's also a lesson about people passionate about a new medium (two actually, radio and then television) experimented to find it's potential. There are lessons here for games as a medium, especially for serious fare. Finally, the audiobook uses some original recordings which are well worth hearing. Murrow's recount of riding shotgun on a British bomber on a bombing run over Berlin is electrifying, white-knuckle listening, even sixty-plus years later. My only complaint about the book is that the author, in his conclusion, claims we'll never have another Murrow because the mediums have already been invented - there'll never be another 'birth' period to live through. This is of course untrue. We are still in the midst of the reforming of journalism for the Internet, for one. And games as a medium for news journalism and editorial are even earlier in their development, with folks like Ian Bogost, Molleindustria, and others helping the form to take it's first steps. I still recommend it as it's easy enough to ignore the author's assertion here and think about what a "Murrow of Games" would challenge us to do with our "Lights in a Box". Lately, I've been doing 4-5 books in parallel. A book in the gear bag, a book on the night table, one floating around the house, one on the iPad, and something lightweight on the phone. The latter of these, my pick for the iphone, needn't be lightweight in sense of subject matter, but rather for phone use I tend favor books digestible in short chunks. Books by Seth Godin, Hugh McLeod or Guy Kawasaki come to mind. It was in this vein that I came across Do the Work by Steven Pressfield and thought I'd add it to my reading list. I was really rather disappointed by the book. It's a sort of motivational book about execution, and pushing through resistance (outside and self-inflicted) to complete creative works. While this is a topic that can help many, the problem is that the book doesn't have a lot of substance to it. Unlike Godin, who draws many on-point analogies from experience, or McCleod's ability to cut through to tell-it-like-it-is fact, Pressfield's book is filled with labored rhetoric, repetitive truisms and the like. I didn't find it of much use. YMMV. 600M revenue in 2010, almost 4X 2009. $235M revenue Q1 this year alone. So, all in all they are doing very well, and it certainly looks like a better investment than GroupOn or any of these other crazy IPOs that have people crying bubble. But hang on a second. It still smells funny. Look at it from 10,000 feet. The company is HIGHLY dependent on one platform/vendor (Facebook), they don't have nearly the revenue or war chest that the incumbent publishers have, etc. Allocation of R&D costs: Details on R&D are sparse, and the statement just cites increases in headcount, etc. What it doesn't say is whether that's because of a broadening portfolio of games (that would spread risk) or whether individual game title budgets are growing, which would suggest an increase in risk, as each title becomes a bigger gamble. Risks posed by entry of EA and other incumbents: As the major publishers awaken to social games, this could have a three-sided effect on Zynga: (i) R&D costs go up to compete on product quality, (ii) possible loss of MSS as the publishers bring major titles to market, and (iii) user acquisition costs go up as the competition drives CPMs on FB's ad network up. Do they get preferential ad pricing and/or placement as a result? Although signed in July 2010, the S1 states the migration was only completed April 2011, so how much of the revenue from 2010 and 1Q11 was earned at 95 points on the dollar vs 70 points? With any company, it'd be possible to ask infinite numbers of questions to learn or infer more. In this case though, I think there are at least a couple key things that investors should consider.